So I’ve been in Spain for 2 weeks now and you’ll be happy to know I have managed to tear myself away from the markets and my little kitchen and venture out to a couple of restaurants and a wine tasting. Actually even the wine tasting had amazing tapas, but I digress. I haven’t yet found anywhere to try the most famous and possibly most abused of Spanish dishes – Paella. Not that there aren’t plenty of restaurants touting a mind boggling number of Paella options. More that I’m being a little precious about my first Paella experience this time and would rather give it a miss than experience a mediocre version. Paella can be even more difficult to do well than Italian risotto. Not only does one have to juggle the cooking times of the various inclusions which tend to be seafood, there is only one chance to get the amount of liquid correct. Then you have to nail the cooking temperature so that it’s high enough to leave the socarrat – the prized crust on the bottom of the pan, but not so fierce that it burns before the rice is cooked. I’ve found, there’s so much more to the Spanish love affair with rice than just paella. 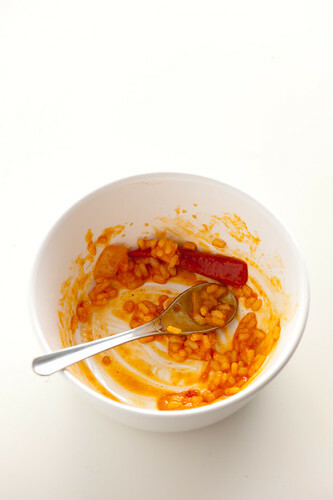 And thankfully for us minimalist home cooks, the more simple Spanish rice dishes are much less demanding. Just brown an onion, add rice, flavourings and liquid and simmer gently, stirring when you remember – nothing like high maintenance risotto that chains you to the stove. 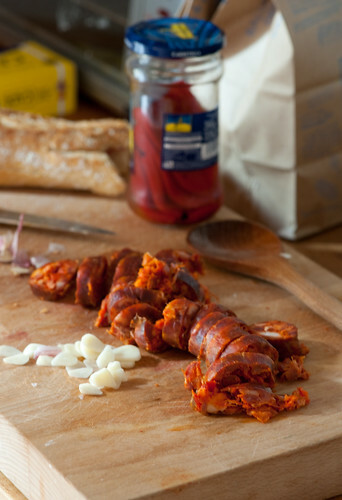 And did I mention it’s a great excuse to use some fabulous Spanish chorizo? I’ve long been a devotee of the holy sausage, but I wasn’t prepared for how much more intense Spanish chorizo would be. It is a flavour explosion of deep smoky salty porky goodness – makes Australian chorizo look as bland as a frankfurter. Another reason to stay in Spain. I am still keen to try a good Paella so if you have any recommendations, would love to hear about them in the comments. Inspired by Simone Ortega and her quintessential book on Spanish home cooking – 1080 recipes. It’s up to you whether you make this rice focused or more about the chorizo. I used only 2 chorizo and really enjoyed letting the rice shine but by all means add 4 chorizo if you’re feeding particularly hungry carnivores. If you can’t get your hands on pimentos you can either leave them out or char and peel a couple of red capsicum (peppers). This would also make a lovely vegetarian (even vegan!) meal. Just leave out the chorizo, substitute vegetable stock for the water, and toss through a can of drained chickpeas when you add the pimentos. Heat oil in a large saucepan and cook onion over a medium low heat, covered and stirring occasionally until soft but not browned. Add garlic and chorizo and cook for another minute or so. Add rice, tomatoes, paprika and water and bring to a simmer. Cook stirring occasionally until the water is absorbed and the rice is soft – 20 minutes mas ou menos (more or less). If it becomes a little dry before the rice is cooked, add a little more water. Stir through pimentos, season well and allow to heat through. Divide between serving bowls and serve hot. keep up to date with stonesoup happenings – subscribe by email HERE. for more about my adventures in Spain visit my tumblr page. Glad you are enjoying Barcelona. It’s got even colder over here now, so you may get visitors. I was looking through a book yesterday and found a recipe for chirozo cake. A bit like savoury scones I guess, but I will stick to banana and ginger. Yummy photos….sorry I don’t have a recipe on offer. I tend to think rice dishes are meant to be cooked to taste. For instance, I love a soft rice risotto but some like it al dente. I’m not going to recommend you a good paella in BCN, most of them are “just for tourists” so you are doing it very well being careful. I’m going to recommend you the most incredible tapas bar in Barcelona you can imagine. It’s going to be a bit expensive, I have to say. Prepare 45 to 60 euro per person if you want to have some wine and 15 more for the taxi, as it is a bit far from the city centre. You can go with the subway too, if you prefer. The place is called “Els tres porquets”. It’s located in Rambla del Poble Nou,165, very close to GRAN VIA and PLAÇA DE LES GLORIES. ps: once you are there, ask them about “can pineda”, it’s very close, and it’s another impressive place ;) Enjoy! and whatever else you can order will be from great, to impressive. Unfortunately I don’t know “el bulli”, but I’m sure this is not far. In fact is a very different type of food, as this is traditional spanish food. Let me know if you decide to give it a try. Actually, best paella at Kaiku. Best “modern” rices at La Mar Salada. And best CREATIVE rices at LA MIFANERA. One of best restaurants wich uses more than 50 types of rice from all over the world, and they cook in plenty of diferent ways. In my personal opinion, Set Portes it’s out of time and we have TOO MUCH places who cook BAD PAELLA, ask lot of money and are DISGUSTING. Have a good paella in Barcelona it’s very difficult. This looks good, I am going try this making this one. This will remind my wife of the fantastic time we had travelling through spain. Yes, good to be cautious with Paella. One thing we learned is to never eat it in a place that has laminated full-color Paella menus. They use bulk manufactured and frozen paella products, and don’t make it themselves. gosh look at the colour of that chorizo…I bet it tastes fantastic too (*real* chorizo). I am jealous….but glad we are vicariously enjoying Spain with you! This looks YUMmy. Can’t wait to visit the markets and cook this for myself. Thanks, Jules. Don’t stir paella rice!! Unlike risotto, you don’t want to develop the starchy coating. 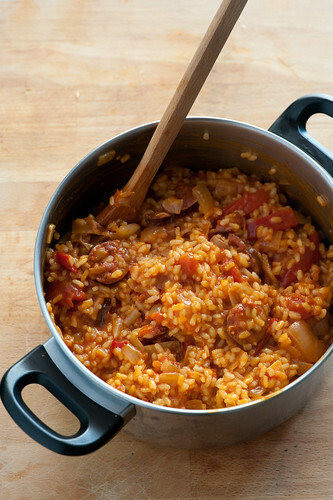 Both use round-grain rice (calasparra or arborio), but method is different. Paella not difficult–best advice I got from a Valenciano–practice every Sunday! My paella recipe is from the Hotel Ritz Madrid which I came across back in 1999 in a Vogue Entertaining. I haven’t made it since moving to Australia as I cooked on gas in NZ. I’m a bit worried about using glass top stove as it is difficult to control the heat. I have bought a gas camping stove and intend to try it on that. Great to hear you are having a fabulous time. I love Spain. I’d recommend Can Majo in Barceloneta – we ate there twice when visiting in September. Though I agree with you on the markets, I love to stay in an apartment in Barcelona just so that we can prepare food bought at market. Santa Caterina was probably my favourite. Hope you continue to have a wonderful time. paella from the ritz in madrid sounds pretty fancy – I love it. And a question regarding the above recipe – what kind of jared pimentos are those? Pickled or? it’s sweet of you to say so. Oh, wonderful! I too am intimidated by paella… this sounds a lot more manageable and I have some chorizo in the freezer just waiting for its day in the sun! I’ve just discovered your blog and spent the last few hours reading through it (I have a very boring job as a receptionist!). It’s brilliant and I’m totally absorbed. 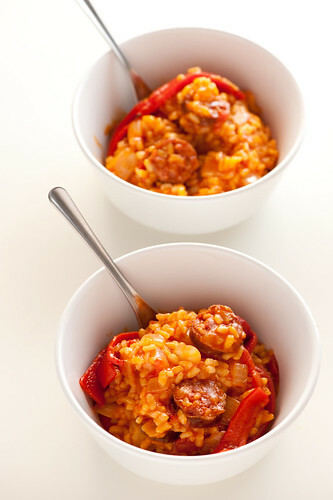 You have some wonderful recipes on here which I just can’t wait to try – the arroz con chorizo being the first! glad to hear stonesoup is helping relieve your boredom! Just one tip to do better your paella. When you add the water, it must be boiling. This way you don’t stop the cooking. In the Barceloneta area, I too like Can Majo’ (was just there Saturday night) and Cheriff on Carrer de Ginebra (very old world). I have to try Lopez’s suggestion, Els Tres Porquets – it sounds incredible! The name means ‘Three Little Pigs’ in Catalan… I, too, can’t wait to hear about el bulli. thanks for the tips tracy – I’m running out of time to try everywhere – if only I hadn’t spent all that time shopping at the markets and cooking at home. i found your blog by accident and tried this recipe and can i say A M A Z I N G! so simple yet so fillingly delicious i could have it everyday.